The incident happened yesterday afternoon (26/09). West Bay Coastguard Rescue Team was called at 4.01pm by Solent Coastguard NMOC (National Maritime Operations Centre) to reports of two dogs that had fallen down the cliff face just to the South of Highlands End Holiday Park. Officers from West Bay then picked up their equipment and rescue vehicle before heading to Highland’s End. They were joined by officers from Lyme Regis and two senior coastal operations officers, who were in the area at the time. 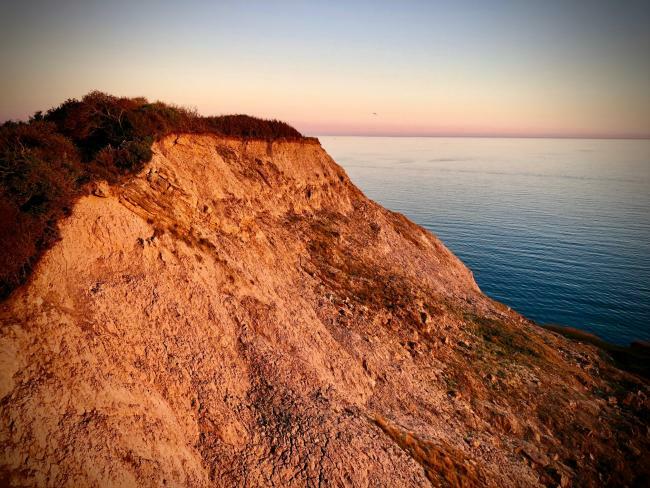 Once on scene and under the command of the West Bay OIC (Officer in Charge) a roped edge safety system was put in place so an officer could safely approach the edge of the cliff and get a firm location on the dogs. A spokesman for West Bay Coastguard Rescue Team said: “The first dog, a Cocker Spaniel, was found to be freely moving around the upper cliff levels whilst the second dog, a Collie, was lying injured and reluctant to move. 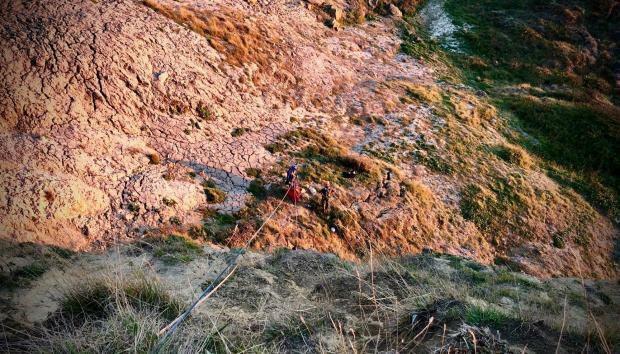 “A full cliff rescue system was set up and a ‘cliff technician’ was lowered down the cliff face to the friendly dogs. “The uninjured Cocker Spaniel was recovered first and placed into the teams ‘Animal Rescue Bag’. Both the officer and dog were then winched back up to the top of the cliff where she was reunited with her owner. The officer was then re-deployed over the edge of the cliff to recover the Collie. Once on scene, the vet was placed into a cliff rescue harness, given a helmet and briefed for the descent. He was then attached to ropes with the cliff technician who took the vet down the cliff face to the injured animal. Once the dog was recovered, the Cliff Technician descended the cliff for the final time to recover the vet back to the top of the cliff. The teams then stood down to return to their stations. Onlookers told of the rescue. One person said: “One of the dogs looked like it had injured its leg. Coastguard have since issued a warning to dog owners. It says: “The Coastguard recommend that you always keep your dog on a lead on the cliffs and coastal paths. “Some dogs, especially smaller ones can have difficulty seeing the cliff edge and if the worst happens… NEVER, EVER attempt a self rescue as you could be putting your life needlessly at risk. A DISTRAUGHT husband has criticised the organisers of Ironman Weymouth after his dying wife’s Macmillan nurses were delayed by the event for nearly three hours. A motorcyclist airlifted to hospital with serious injuries following a crash between a van and a motorbike in Poundbury has sadly died. A 46-year-old diver, who surfaced unconscious from a Portland dive, has died.